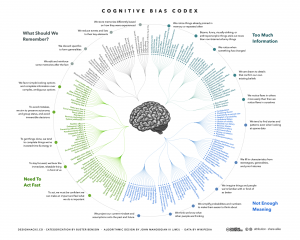 In my critical thinking class, we begin by studying 17 cognitive biases that are drawn from Peter Facione’s excellent textbook, Think Critically. (I’ve also summarized these here, here, here, and here). I like the way Facione organizes and describes the major biases. His work is very teachable. And 17 is a manageable number of biases to teach and discuss. 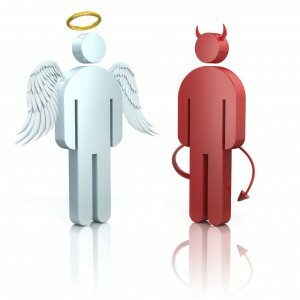 While the 17 biases provide a good introduction to the topic, there are more biases that we need to be aware of. For instance, there’s the survivorship bias. Then there’s swimmer’s body fallacy. And the Ikea effect. And the self-herding bias. And don’t forget the fallacy fallacy. How many biases are there in total? Well, it depends on who’s counting and how many hairs we’d like to split. One author says there are 25. Another suggests that there are 53. Whatever the precise number, there are enough cognitive biases that leading consulting firms like McKinsey now have “debiasing” practices to help their clients make better decisions. 1) Biases that arise from too much information – examples include: We notice things already primed in memory. We notice (and remember) vivid or bizarre events. We notice (and attend to) details that confirm our beliefs. 2) Not enough meaning – examples include: We fill in blanks from stereotypes and prior experience. We conclude that things that we’re familiar with are better in some regard than things we’re not familiar with. We calculate risk based on what we remember (and we remember vivid or bizarre events). 3) How we remember – examples include: We reduce events (and memories of events) to the key elements. We edit memories after the fact. We conflate memories that happened at similar times even though in different places or that happened in the same place even though at different times, … or with the same people, etc. 4) The need to act fast – examples include: We favor simple options with more complete information over more complex options with less complete information. Inertia – if we’ve started something, we continue to pursue it rather than changing to a different option. It’s hard to keep 17 things in mind, much less 104. But we can keep four things in mind. I find that these four categories are useful because, as I make decisions, I can ask myself simple questions, like: “Hmmm, am I suffering from too much information or not enough meaning?” I can remember these categories and carry them with me. The result is often a better decision. You too can be a revered leader. Want to Be A Revered Leader? Here’s How The 25 Most Admired CEOs Win The Hearts of Their Employees. Does this sound familiar? It’s a good example of the survivorship fallacy. (See also here and here). The 25 CEOs selected for the article “survived” a selection process. The author then highlights the common behaviors among the 25 leaders. The implication is that — if you behave the same way — you too will become a revered leader. Is it true? Well, think about the hundreds of CEOs who didn’t survive the selection process. I suspect that many of the unselected CEOs behave in ways that are similar to the 25 selectees. But the unselected CEOs didn’t become revered leaders. Why not? Hard to say …precisely because we’re not studying them. It’s not at all clear to me that I will become a revered leader if I behave like the 25 selectees. In fact, the reverse my be true — people may think that I’m being inauthentic and lose respect for me. 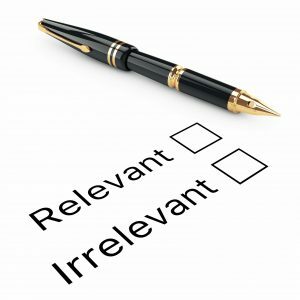 A better research method would be to select 25 leaders who are “revered” and compare them to 25 leaders who are not “revered”. (Defining what “revered” means will be slippery). By selecting two groups, we have some basis for comparison and contrast. This can often lead to deeper insights. 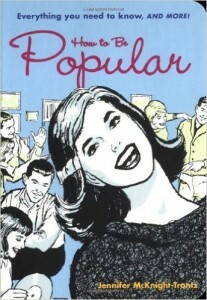 As it stands, the Inc. article reminds me of the book for teenagers called How To Be Popular. It’s cute but not very meaningful. Interesting syllogism. But the premise is unsound. That’s why I get the big bucks. We can only judge programs and processes based on their goals. If the goal of government is to provide good services at a reasonable cost, we might give it a fairly low grade. However, if the goal of government is to increase employment, then we might evaluate it more positively. The same is true of higher education. So what is the goal of higher education? Is it to teach students how to think? Or is it to provide them skills to get a job? 2) The future is unknowable — our niece, Amelia, will graduate from college next May. If she works until she’s 65, she’ll retire in the year 2060. 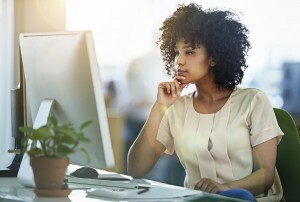 What skills will employers need in 2060? Who knows? As I reflect on my own education, the content I learned in college is largely useless today. The processes I learned, however, are still very relevant. Thinking is the ultimate process. Amelia will still need to think effectively in 2060. 3) Thinking promotes freedom – if we can’t think for ourselves, we will forever be buffeted by other people’s agendas, desires, ambitions, and rhetorical excesses. Critical thinking allows us to assess ideas and social movements and make effective decisions on our own. We can frame our thinking as we wish and not allow others to create frames for us. We can identify the truth rather than relying on others to tell us what is true. Critical thinking, allows us to take control of our own destiny, which is the essence of freedom. I don’t know of any other discipline that can make the same claim.